Do you have monster-like-behavior lurking in your house? Whining, Screaming, gnawing at your emotions and patience? Like any monster, in order to survive, this behavior has to be fed a daily dose of sustenance. What are your giving to your child’s behavior that helps it survive? Is it a dollop of good old fashioned attention that feeds the wild beast? Is it your emotional reaction that this behavior gobbles down and then begs for more? Is it conversation and debate that helps this behavior linger around your dinner table a little longer? How do we put an end to the monster behaviors and replace them with civilized, well mannered, regulated princes and princesses? First: In order to put an end to the monster we need to name it… I don’t mean calling it Godzilla, King Kong, or Snufflelufogus… We just need to say what it is: biting, pushing, talking back, arguing, tantrumming, or refusal to do something. If we don’t name it we can’t get rid of it. Second: Once your monster has a name, you need to go on the search for this behavior around your house and throughout your day… This is a bold and scary step, but you can’t take care of a monster until you know where or when it shows up and find the patterns to the behavior… So be on the look out for monster behavior hiding in the shadows of your day. 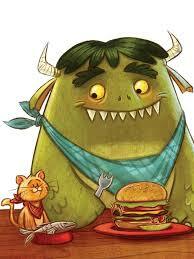 Third: When you see the monster stop feeding it. That means stop talking so much, stop the back and forth tug of war which Monsters love to compete in, stop reacting to the monster with shrugs, screams or emotional breakdowns. Monsters can only survive when you feed them. Start to be aware of how you as the parents might be contributing to the life of the behavior. Fourth: Visualize peace in your kingdom and decide what you would like to replace the monster behavior with… sharing, caring, using words or kind actions and then train your monster on how to replace the yucky behavior with more appropriate behavior. What would you like to see more of? And how can you teach them how to do it right? Fifth: When a little prince or princess shows up feed them with positive reinforcement. Let your kids know that you would like to see more of the positive behaviors in your kingdom and do this by saying a quick, “I noticed….” sentence. Follow these steps and you will begin to turn this scary script into a fairy tale. Quick Tips for Monster Slayers! Give them the tools and practice they need to learn to take a break and melt away their Monster emotions. Give them opportunities to take a break and rejoin the social scene when they are ready to be nice. Take a break yourself when you need it and pause before you enter into the Monster’s territory. Walk away and tell them to let you know when they’re ready to make a better choice… don’t engage a monster!!! Make a vow to stop feeding the monsters in your house and you will find that your home is filled with waaaaay more treats and a lot less tricks!